You may have heard about the DSTRKT nightclub saga. If you haven’t, don’t worry, this is what I am here for! Peaceful protests have taken place and these were sparked by four ladies highlighting their experience with DSTRKT. The ladies have made claims they were denied entry into the club because two of them were deemed to be too dark AND too fat to be worthy of getting in. Bold claims to make but these were backed up by messages sent from a club promoter. The messages have since been published online, by Lin and various media outlets, confirming the reasons they were denied entry into the club and suggested that they try Cafe de Paris instead. Not surprisingly, Twitter and other social media users had a proverbial fit. A number of people organised a peaceful protest outside the club to demonstrate their disgust at the club and its entry criteria. The ladies posted the picture below to confirm attendance at the club, only to be informed entry would not be permitted due to the skin and weight factors mentioned earlier. Lin Mei has become somewhat of a spokesperson for the group, appearing on various news outlets to speak on the contriversial reasons the group were denied entry. 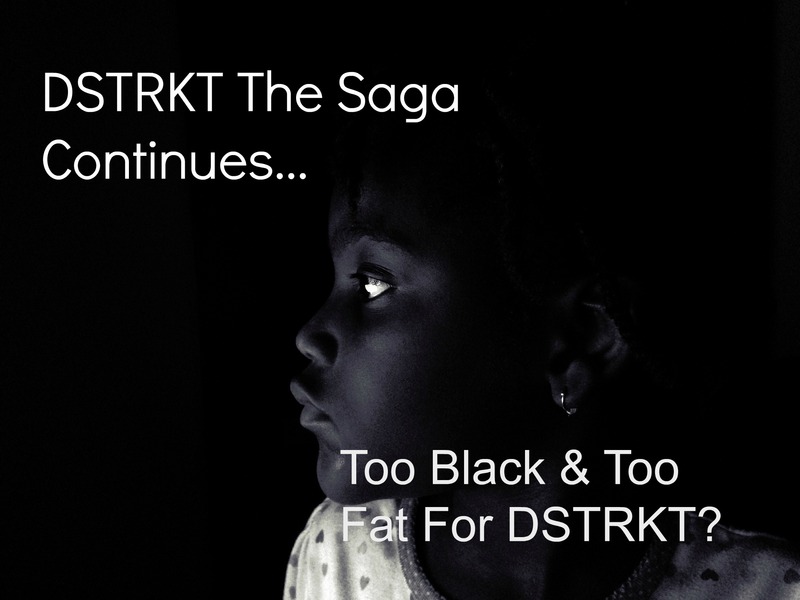 DSTRKT initially offered no comment, but on October 1, broke their silence with a statement denying such discrimination. Karrueche Tran, ex-girlfriend of Chris Brown, attended the club and was somewhat ambushed by the protesters. They made it clear that they didnt think she should ‘host’ at a club who’s entry criteria was dependent on a persons skin colour or size of their waistline. DSTRKT supporters have been scouring Lin’s Instagram and Twitter (as have I) to find out more information about her. There was one post, that has since been deleted from Lin’s Instagram page which shows her IN DSTRKT. She is with a gentleman that is darker and thicker set. Some social media users are saying that it cannot be racism as there is the proof that they do not follow any policy, with regards to race and that they accept all, in a look we let him in, sort of way. Side eye This really irked me much like the ‘look I’m not racist, I have black friends’ comment does. It irks because having evidence that one person who previously attended the club that seemingly didn’t meet the prescribed criteria, doesn’t scream inclusiveness. This evidence cannot be used as a means to effectively tell people to stop moaning, protesting or is an effective rebuttal. It does nothing to negate the experiences of those who are sharing them. The plot well and truly has thickened and I am sure its not over. I normally give my two pence worth on topics such as these as you may be aware; racism, feminism and social injustice are just a few topics I am very passionate about. However I am slightly conflicted as I am not sure how I feel when it comes to exclusivity and choosing who you want to mix with and having THAT ability and freedom to chose, verses the perceived notion of ‘White is right’ and boo hoo if you don’t fit the mould of cis gendered, white and able bodied that is the status quo. I do feel that we shouldn’t be giving establishments like this our support and you should vote with your feet when it comes to social injustice but would it work though? Do demonstrations actually make a difference or is it free advertising? Surely If we just go elsewhere we have lost the battle for equality. If people create their own exclusive clubs and space for specific people how can we ever aspire to eradicate social injustice? The distant cries of reverse racism can already be heard! whatever that is! Where is the side eye emoji when you need it? What peeves me the most though with this demonstration is that it could come across as begging and I don’t feel that we need to beg to be anywhere! What are your views? Let me know! Hit me up on my social media, comment on this article and tell me your thoughts. Glad I could shed some light on it. I dunno what to make of it either. Usually I am full of disdain for fence sitters I’m like pick a side. It just goes to show how insidious it all really is. Did you manage to catch ‘Is Britain racist?’I think society can alter how people’s brains work and how they view the world. Race is a social construct that carries a lot of weight and connotations.